B. Eichapfel was a camera maker in Dresden, Germany. 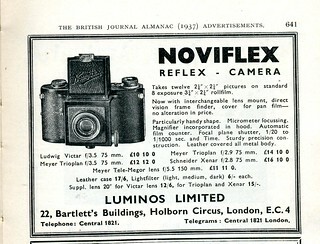 The firm is known only for two models of the Noviflex, a rigid, metal-bodied single-lens reflex camera for 6x6 cm exposures on 120 roll film, but this camera is significant, being widely acknowledged (for example by McKeown) as the first 6x6 cm SLR, from 1934. The better-known Reflex Korelle by Kochmann followed in 1935. A perhaps-related Friedrich Wilhelm Bernhard Eichapfel is co-claimant in a patent for a folding hand-camera design in 1903 with Adolf Richard Lange. Lange and Eichapfel are both described in the patent as works managers of Dresden. The claims of the patent mostly concern arrangements to give the same focal plane for both roll film and plates, so that a ground-glass focusing screen can be used for both (i.e. detachable roll film and plate backs). Lange was also the sole holder of other patents, including one for a focal-plane shutter. 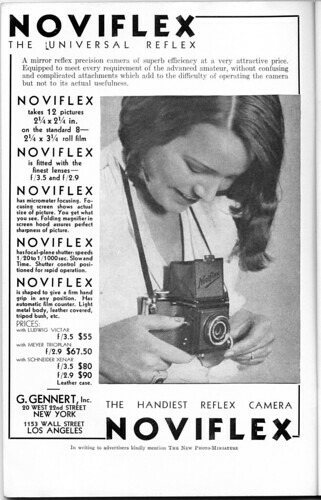 The first Noviflex, from 1934, has a fixed lens. McKeown lists a wide choice of lenses, all 7.5 cm and mostly f/3.5 or f/2.9, including Victar, Meyer Trioplan or Primotar, and Schneider Xenar, also available as an f/2. The camera has a cloth focal-plane shutter, travelling horizontally, with speeds 1/20 - 1/1000 second, plus 'B'. The speed control is a knob at the right-hand end of the top plate. The film advance knob is at the other end; winding the film tensions the shutter. The advance knob appears to have a frame counter. There is a red window in the bottom right hand of the back. The camera has a folding viewfinder hood on top, with a hinged focusing loupe. The example shown by McKeown, and one sold at Westlicht have unit focusing, with a knob on the left side of the lens housing. An example shown at the Hungarian Museum of Photography has an 8 cm f/2.7 Carl Zeiss Jena Tessar, apparently with helical focusing on the lens barrel, though the camera's case has a hole for the focus knob. McKeown lists a second model of the camera from 1937, with interchangeable lenses, though he only lists a Meyer 15 cm f/5.5 Tele-Megor A Noviflex was sold by Christie's in with a 6-inch Wray lens. At this time, there were no retro-focus lens designs, so there could not be a wide-angle lens for a rigid camera body of standard depth. Some cameras have a folding frame finder on top, in addition to the focusing hood. McKeown describes this as a feature of the second model, but both the example at Westlicht and that shown at the Hungarian Museum of Photography have this finder. McKeown also describes the second model as having a red window cover, but the example at Westlicht also has this. ↑ 2.0 2.1 2.2 2.3 2.4 McKeown, James M. and Joan C. McKeown's Price Guide to Antique and Classic Cameras, 12th Edition, 2005-2006. USA, Centennial Photo Service, 2004. ISBN 0-931838-40-1 (hardcover). ISBN 0-931838-41-X (softcover). p261. ↑ British Patent 4324 of 1903, Improved Photographic Pocket Camera, granted to A.R. Lange and F.W.B. Eichapfel. ↑ British Patent 22324 of 1904, Improved Roller Blind Shutter for Photographic Cameras, granted to A.R. Lange (then of Laubegast, near Dresden). ↑ Eichapfel genito-urinary instruments in the Museum Boerhaave, the Netherlands National Museum of Science and Medicine. 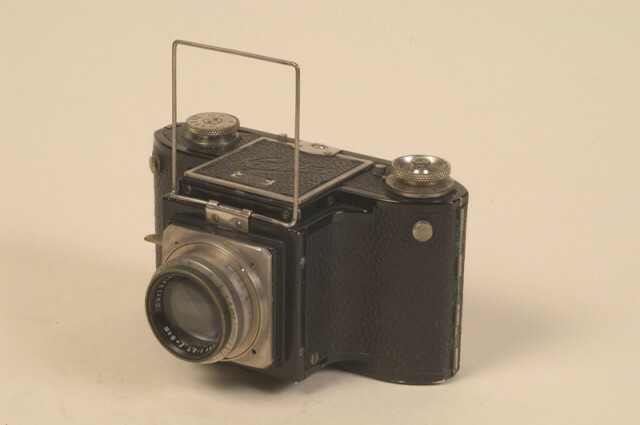 ↑ 6.0 6.1 6.2 Eichapfel Noviflex, first model, with 7.5 cm f/2.9 Xenar (the lens serial number 1038659 dates the camera to 1936 or 37), sold at the nineteenth Westlicht Photographica Auction, on 28 May 2011. ↑ 7.0 7.1 Noviflex with 8 cm f/2.7 CZJ Tessar, at the Hungarian Museum of Photography (several pictures). The serial number 659762 of the lens dates it (i.e. the lens) to 1925-6. ↑ Noviflex (no pictures) second model, with 7.5 cm f/3.5 Meyer Trioplan standard lens, and 6-inch f/6.3 Wray Plustrar long-focus lens, sold in August 1998 at Christie's in London. This page was last edited on 3 September 2018, at 05:33.